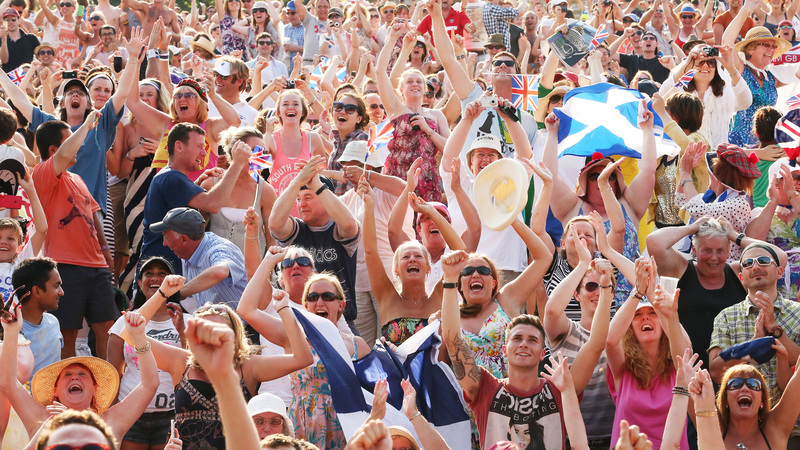 If you're among the fortunate 15,000 people who can afford the $4,164 ticket price to get into the stands at Wimbledon's Centre Court this week, you're surely in for a very exciting time. If you're not, you'll just have to imagine what that excitement feels like. And Jaguar wants to help you with that. 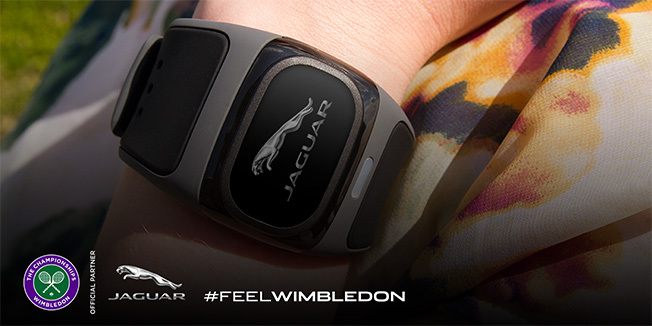 As part of a new campaign called Feel Wimbledon, the British luxury automaker has come up with an intriguing way to link its brand with the iconic British sporting event. Worn by members of the crowd, the cuffs measure heart rate and other biometrics. What exactly does a data picture of an excited crowd look like? More or less like a multicolored, pulsating blob. As Mindshare's strategy head Chris Cardew explains, the data itself means little until a team of 30 analysts overlay the actual match events via time stamps that show who's playing whom. "The tennis," he said, "is the context to what the data shows." "When Andy Murray walks onto the court and everyone suddenly shoots up and moves around, that's about pride and anticipation," he said. "The match provides the moment in the story, and the data validates it." But what's any of this got to do with Jaguar? Apart from the prestige factor of putting its name on the legendary grass courts of Wimbledon itself, Jaguar is trying to make a thematic connection between the excitement of watching world-class tennis and the excitement of driving, say, a $85,000 XK. Jaguar also seems to be trying to shake itself of lingering perceptions that it isn't as contemporary and tech-savvy as slick German competitors like Audi or BMW. "Here in the U.K., Jaguar is still seen to be a bit of an old, stuffy British brand," Cardew said. "This is a big demonstration of how Jaguar is investing in technology and isn't just a car for old men." Are fans really going to equate biometric digital visualization with the fun of driving a Jag? Probably not, according to Petur Workman, business development vp with branded content producer Phoenix Media Group. "I like the idea of giving out bracelets and engaging people," he said, "but I don't see where they're going with this." Workman believes the excitement of tennis comes from watching it, not seeing a digitized emotional profile of other people's reaction to it. What's more, he adds, the technological picture is an obvious one. "If I'm at Centre Court, of course my energy is going to buzz, and my pulse will race—it's just commonplace," he said. James G. Brooks, CEO of digital video platform GlassView Media, thinks Jaguar has the setting right—"their presence at Wimbledon is on point," he said—and gives it points for at least trying something cutting edge. "Any brand that's at the forefront of measuring social motivation, trying to better understand what makes humans tick, is heading in the right direction," he said. If Jaguar's latest marketing effort seems a bit out there, it bears remembering that last year, IBM plucked tennis data from the U.S. Open and composed music with it.